Tile Heaven: Innovations, Arts & Crafts, Special Processes, Hand Painted. 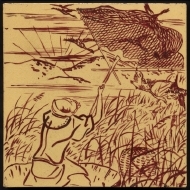 Tiles that are out of the ordinary, mostly those made by other than the usual printing and majolica techniques and all with artistic skill or technical merit. Included are some tiles by makers generally considered to be 'arts & crafts' companies even though the wares may not strictly accord to the true definition of arts & crafts. Arts & crafts movement style (in itself a misnomer) tiles in transfer print and majolica techniques are on the appropriate pages (although we may let the odd one or two gorgeous examples slip by). Arts & Crafts (entirely handmade). Barbotine (decorated in slip clay). Barbotine Stencil (slip clay applied through stencil). Sponged Stencil (stain applied with a sponge producing a soft texture). Marsden's Patent (decoration in colour or relief impressed in to the tile surface). Applied encaustic (embossed ornament applied as dust clay somewhat similar to sprigging). Émaux Ombrants (impressed/embossed with very translucent yet intensely coloured glaze). Tubeline (hand drawn outline in slip clay coloured in with majolica glazes). Slip trailed (the outline applied by pouring on slip, usually coloured in with majolica glazes). Cuerda Seca (the outline painted with slip using oil as the medium thus resisting water-based glazes). Early or particularly fine examples of any technique or even style/design. 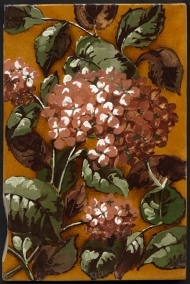 Unusual combinations of techniques, such as tubeline over stencil or enamel painting over embossed. The phrase Arts & Crafts has been expanded from its original meaning, language degenerates as dealers, auctioneers, collectors and authors alike seek to bolster their reputation and the price of their wares by claiming properties that are unjustified. Originally it described hand made wares decorated in a then unconventional style often based upon medieval influences the method of manufacture and of decoration intended to authentically reproduce medieval wares. Figures were painted in the pre-Raphaelite manner, floral subjects imitated walls or trellises covered with climbing plants similar to fabrics, wall hangings and carved panels from grand homes of the medieval period or plants in pots. Industrially produced wares in similar styles to these briefly became known as 'arts and crafts movement style', then abbreviated to 'arts and crafts style', then, and giving quite the incorrect impression, simply 'arts & crafts'. Now one sees works of Moyr Smith described as arts & crafts, and those of Christopher Dresser (not that he designed any tiles but people claim so) are called arts & craft. Dresser's reutation is based upon his being an industrial designer, an adopter of modern styles and modern techniques, the antithesis of arts & crafts. The phrase arts & crafts in respect of ceramics is rapidly becoming meaningless. 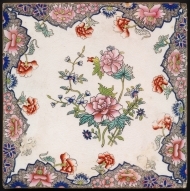 Most eight inch square tiles were made from around 1870 to around 1890, outside of these dates they were rarely seen. Being larger tiles they offered more scope to artists, a larger 'canvas', so a greater proportion than 6" x 6" tiles are hand painted but other different from the norm techniques are underrepresented. Hand painting is one of the oldest processes for decorating tiles probably only predated by incised decoration. Late 19thC and Edwardian hand painted tiles were likely not decorated by the company whose mark is on the back of the tiles, many companies sold unglazed tiles to other manufacturers who would decorate and often apply their own mark most often painted through a stencil. There was also a reasonably well developed industry in tile decorating and furniture makers may have used the services of a local artist, pottery or art studio. 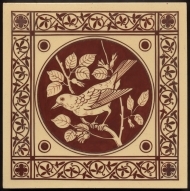 Tile decorators of the time would often buy in plain white tiles and decorate with enamels, in the late Victorian era it was popular to decorate plain tiles and it was a recognised pastime for well to do ladies. There were even books of patterns suitable for tiles and books published for home schooling although it seems that most were copied from illustrated romantic novels of the time. Enamel decorated tiles enabled a much wider range of colours although not being protect by a high-fire glaze they are more prone to wear. Some companies openly copied designs by other companies, copyright only lasting for three years back then. Relatively few tiles were hand painted under glaze due to the range of colours available that were able to withstand the kiln temperatures required to melt the glaze, enamel colours were baked on to the glaze surface at lower temperatures. The tiles of W B Simpson and W T Copeland are especially outstanding for their range of brilliant underglaze colours. The colours when applied would be very different from those after firing so the artists had to have a greater understanding of the medium than enamel painters and especially watercolour painters whose colours were very similar from application to finished item. Monograms or signatures imply that a major company didn't decorate the tile as major manufacturers rarely permitted artists to identify their works, usually only when the artist's name was so well known that it would add value and assist in the sale of the tile. Often in a set some will be signed and others not, artists tend to sign works they are most happy with and leave the lesser works unsigned. As tiles may have been purpose made for a particular project like fitting in to furniture numbering on the back is common so that the furniture maker would fit the tiles in the specified position. Many hand painted tiles by major manufacturers and the art potters were not freehand painted, there was some sort of an outline for the artist to follow. The usual process of a transfer print coloured in is well known but the outline could have been applied in a number of ways using carbon (soot or charcoal) which would then burn away in the firing leaving no evidence of its existence. This carbon outline could have been pouncing with carbon dust through a stencil, smoked through a stencil or applied by transfer print (carbon printing was invented in 1855), it may also have been sketched in charcoal. Another method was to paint on to transfer paper rather than the tile, this was done by laying a sheet of translucent transfer paper over a pattern and painting on to it. This painted transfer paper was then applied to the clay tile and when fired the paper would burn away. The tile could even be glazed over the paper in which case the colours tended to migrate in to the glaze rather than attach to the clay giving a softer outline. No doubt other methods were used too, casting a outline in light on the tile rather like how an overhead projector works is a fairly obvious method and the victorian tile makers were very innovative in their decorating techniques. Barbotine describes decorating with slip, it is a french word and entered the english tile parlance with Sherwin & Cotton introducing their barbotine range. 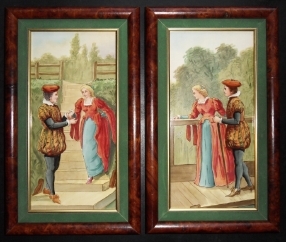 This was an Arts & Crafts process whereby the effect of relief moulded tiles may be hand made, the relief formed by painting on the designs in coloured slip similar to impasto in painting. Impasto barbotine has more in common with original majolica than most other victorian majolica wares but it is not generally recognised how innovative such tiles were in the marketplace, they didn't compete with typical moulded majolica tiles, they predated them. Other manufacturers tried to copy them using mechanical processes, i.e. moulded 'modern majolica' but it took a few years of pretty poor efforts before reasonable quality and a range of colours even equal to barbotine was achieved. When dust-pressed relief tiles became the norm Sherwin & Cotton painted them with slips, they still called them barbotine even though the relief was created by the clay body and not the slip, this is technically correct as barbotine refers to slip decoration however it is applied. Whilst the notion that barbotine tiles were painted multiple times has entered is widely believed this is rarely the case a single painting of fairly stiff slip would give instant relief and most barbotine use moulded blanks. Colours for barbotine processes were limited partly because clay fires at a higher temperatures than glaze so less stable colours burn off during firing. It is taken that the vast majority of mass market impasto barbotine tiles were made prior to 1890 by which time many of the technological hindrances to the production of dust pressed 'modern majolica' tiles had been overcome. Several companies made barbotine tiles but only Sherwin & Cotton produced a large range, they continued to make them in to the 20thC but art nouveau examples are very rare. Burmantofts and Leeds Art Pottery used the process for art tiles especially landscapes many by Harold Leach. Barbotine decoration may also be over decorated, most often found is a coloured glaze and small details painted with stain. Barbotine Stencil or Stencilled Slip often erroneously called Marsden's Patent or Patent Impressed* Simply slip clays applied to the tile blank through stencils, sometimes just one stencil but other times two or more, the slips may be painted or applied with a spatula or any other means the artist my use. Wedgwood are the best known user of the process and indeed sold more designs with the process than any other, Marsden Tile Co., Lea, Malkin and the Jackfield companies Maw and Craven Dunnill also are known to have used the process. Minton are reported to have but I have not seen one and a tile illustrated and so described in a well known book is in error. In common with barbotine and early majolica tiles they had a restricted range of colours and more often than not a coloured clay was used to increase the range as was on occasion a coloured glaze. See the Marsden page for more examples. *Both Wedgwood using the legend incorrectly on not patent impressed tiles and misunderstandings by authors in reading the patent have created the misunderstanding. Marsden's Patent, or 'Patent Impressed' George Marsden patented the idea of putting something (anything!) other than the clay to make the tile body in to the press the something being used to decorate the tile with impressed relief or impressed colour or both. He offered the patent to Wedgwood who licensed it and the two had an association for around eight years. Wedgwood and Marsden are also the two brands most associated with barbotine stencil tiles, confusion is caused by Wedgwood using the legend 'patent impressed' on tiles that are not. Patent impressed refers to something impressed in to the tile, stencilled slips are clearly applied to the surface of the tile. In the example shown alongside the shapes of the petals and leaves are impressed presumably using cardboard, some of the 'cardboard' impressions are painted in with plain brown slip. The speckles of coloured clay are also impressed but there are rather more than usual. One or two impressed colours is typical, here we have four, three across the face of the tile and one just in the impressed petals and leaves. This is one Patent Impressed tile that is really impressive and the unique styling has an impressionist feel. Another fairly common Marsden's Patent technique is to impress lace in to the clay, this would burn off in the kiln and leave the impressed pattern. Doulton & Slater patented a similar process for plastic clay four years after Marsden's patent. As Doulton & Slater's patent (often simply called Slater's Patent) is better known amongst genreal antique and pottery dealers and collectors they assume that similar on dust-pressed tile is the same patent, it isn't indeed Doulton's idea is apparently a copy of Marsden's. Doulton sometimes used the trade name 'Chine' for wares using the effect. 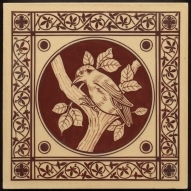 All dust-pressed tiles with the effect are Marsden's Patent, Marsden Tile Co.made mnny tiles for Doulton including using the process, mostly barbotine stencil patterns, but also made such tiles for themselevs, Wedgwood and possibly others including with printed patterns. 'Applied Encaustic', is a mechanical decorating process apparently used only by the western companies Maw & Co., Craven Dunnill and Godwins. Different coloured clays were applied moulded to the tile body to give detailed relief and then coated with a highly translucent glaze, rather like an updated version of sprigging* for dust pressed clay. It is an earlier process dating from the 1870s or even 1860s and in it's time was a super innovative way to produce well coloured quality tiles. Typically red, buff and white clays were used with translucent olive or turquoise glazes, the clay colours would show through but be tempered by the overlying glaze. For example as seen to the right a translucent olive green glaze would give olive green on the white clay, mid brown on the buff clay and dark brown on the reddish clay and and another of similar colours of clay with a turquoise glaze. As all the colours are in the clay and hence very stable and a higher temperature and better quality glaze could be used making for very durable tiles. *Sprigging is when a small mould is made for the decoration which then has clay pressed in to it and is then applied to the piece. Mostly used for pottery decoration and famously Wedgwood's early Jasperware. 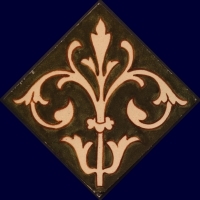 Émaux Ombrants describes a certain type of monochrome moulded tiles and is mostly associated with George Cartlidge particularly his portrait tiles. It produces an almost magical effect rather like a hologram in that the image is three dimensional but the surface of the tile is virtually flat. Rather than the glaze being thinner over raised parts of the design the glaze was thicker and the colour deeper on indented parts of the design. The name gives this away as best translated from the French it means 'enamelled shadows'. The original sculpting of the mould, quality of clay and its pressing were important technical factors in the creation of this decorative effect however the glaze formulation and its application and handling were paramount. The glaze had to be both of extremely high translucency and strength of colour which on the face of it are irreconcilable aims and have very low viscosity so that it would flow into the hollows. Once these material criteria had been achieved the glaze had to be applied very consistently and the tile had to be perfectly level in the kiln as minimal pooling of the glaze would vastly increase its colour strength. As glaze formulation is the main criteria colours were limited, at first to a narrow range of browns, greens and blues. Relief moulded tiles where the high points show lighter the glaze being thinner is a much less technically demanding process, whilst sometimes confused with émaux ombrants especially with figural subjects it is correctly called Trembley after its famous french exponents. Tubelined is a raised slip outline applied like icing a cake and the areas created filled with majolica glazes. Moulded is made in a press with a die to make the embossed outline of the pattern. Tubeline was used for samples, small quantities, murals and special orders in part because it was less expensive than moulding in small quantities. Not only was it expensive in the decorating but earlier examples required the tile body had to be made from plastic clay as the line did not adhere well on dry dust pressed clay, similar to early barbotine tiles. Being cheaper in small quantities should a manufacturer be short of pressed clay bodies for to fulfill an order for a raised outline design the shortfall would likely be made by tubelining a few rather than setting up the press for a new production run. Occasionally installations are found with mixed tubeline and embossed outline where such mixed batches have been used. The raised outline was usually in a stained slip, most often brown or green, coloured slip was used because otherwise the outline would shine bright and detract from the glazes creating more of a simplistic cartoon-like effect especially with darker glaze colours. Richards at times tried to avoid this on white clay moulded designs by overpainting the outline in black stain, see the 'triple tulip' example alongside. Rarely two colours of outline are used where parts of the outline are intended to blend in and others stand out - see the rose tile alongside. There may have been an outline for the decorator to follow which has disappeared in the manufacturing process - see hand painted above. The high raised outline contained the glazes helping to prevent them bleeding and reacting with each other so that the newly available more adventurous glazes could be used. 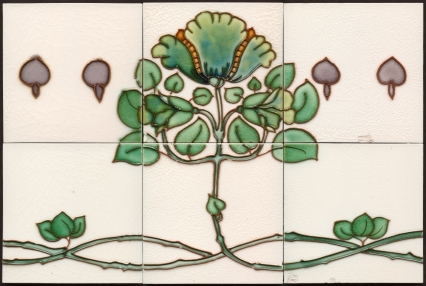 The range of colours found on tubeline tiles is usually greater than on dust pressed majolica tiles and they became fashionable art objects that expressed modernity at the height of the affluence of the British Empire in the Edwardian era. These highly fashionable tiles were made in limited quantities and at a premium price, approximately double that of otherwise similar embossed majolica tiles. Tubelined designs were often fairly simple, this is not a criticism rather the technique was used to demonstrate the flow of line and brilliance of glazes that the outline enabled. Clearly an outline design can not reach the complexity of a moulded design with all the tones achievable by embossed and indented moulding but a moulded design can not achieve the clarity and brilliance of often technically conflicting glaze colours that the outline enabled. 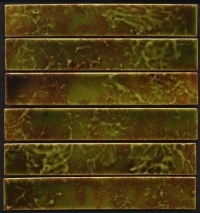 Tubeline is a much misused phrase, ordinary majolica tiles are often described as tubeline when they clearly are not. Tubeline is also sometimes called slip trailed* which is not really correct but perhaps helps to picture the process in action. Sometimes it can be difficult to spot and there are examples of errors in the literature, in Lockett the 'tubeline' tile on page 130 is moulded and many Carter Poole tiles called slip trailed* as in for example Poole Pottery by Leslie Hayward are in fact moulded. Some subsequent publications have many more errors indeed as time goes by it seems they increase. There was some confusion in edwardian times too but then people assumed that tubeline tiles were moulded, Alfred Meakin often used a 'tubelined' rubber stamp on the back of their tiles just to be sure people knew. If the background is moulded at all it is most unlikely to be tubeline. If the verso has moulded (embossed or indented) pattern numbers or design registration numbers it will not be tubeline. Exceptions: none that I have ever seen. * In slip trailing the slip is the actual decoration rather than being a narrow outline that forms the boundaries between areas of different colours as in tubeline. Slip trail is in a contrasting colour to the background and there are often just two colours in the piece, the background and the slip. There are a few coloured art nouveau examples but they are rare (Blanchett shows a four tile panel on page 525). Search for images using the terms: slip trailed plate - plate produces more accurate results than for tile! The slip is usually trailed using a quill, search for text: slip trail quill. Moulded the outline painted with stain to mask the bright white outline. Lustre is rarely found on tiles or indeed any other pottery because the effect is on the very surface of the glaze and easily damaged thus rather defeating the raison d'être of ceramic wares and in particular tiles which are meant to be durable. The process relied on a reaction between the atmosphere in the kiln and the on-glaze stain, carbon and/or hydrocarbons were introduced in to the kiln to burn off the oxygen in the metal oxides that the stains were composed of thus leaving a smattering of reflective metal on the surface. The difficulty and unpredictability of the process also means that rather more faulty lustre tiles were accepted as saleable and they were vastly more expensive than tiles by other techniques, in the order of eight times more expensive than other hand painted tiles of the day. The process has been known about for millennia and over time has had brief periods of relative popularity never really catching on because a brand new object would soon be scratched and worn if used. Its use was therefore mostly restricted to purely ornamental objects and often three dimensional so that the lustre could be appreciated. It is quite unlikely that the process has been lost and rediscovered many times, it's just not that suitable a process for decorating objects that will be handled frequently as most ceramic wares are. William de Morgan & Co. are the best known name for lustre tiles and on occasion produced some fantastic multicolour lustre tiles. Soon, probably just a matter of months, after William de Morgan's lustre tiles gained popularity through Morris & Co.'s marketing Maw & Co. made lustre tiles. They together with their near neighbours Craven Dunnill and the Welsh company J C Edwards produced the best manufacturing quality lustre tiles in the more usual copper (red) and silver (gold) colours. Edwards lustre tiles however may have been made by Maws, they certainly share some of the same patterns. By far the greatest majority of lustres found are red, not because the lustre was at first considered particularly desirable but because it was the only way in the 1870s and 1880s to produce a really good red. Viewed directly on, and in most situations where tiles would be fitted, the lustre is not visible but the amazing richness of the colour is. In order to see the lustrous effect the path of light from its source to the eye must be aligned just so with the tile, where most tiles are fitted below eye level in furniture, dados etc. it is impossible to catch the lustre. Due to their lack of durability they were not recommended for use in fireplaces however on occasion they were so used although usually slabbed or fixed to 'inglenook' walls well separated from the fire. Other wares were also unsuited for fixing where they would be more subject to wear, a range of brilliant persian turquoise glazed tiles were made by Mintons China Works and they declare in their catalogue, "these are not suitable for hearths". In traditional british cast iron fireplaces where the tiles were fitted at an angle close to the fire and viewed from a seated position lustre tiles would have shown the effect to its best being able to catch the reflection of the light from the flames (the light source being nearly at floor level) but due to durability concerns they were rarely used in such situations. During the twentieth century with continued innovation in glaze formulation and kiln technology lustre tile manufacture became more reliable and the range of colours increased dramatically. 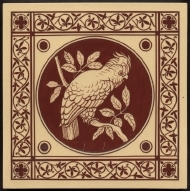 The vast majority of Victorian and Edwardian tiles were dust pressed body decorated with transfer prints (often with hand painted colours) or majolica glazes however both manufacture of the body and the application of the decoration saw many innovations and a wide range of techniques were used. Whilst the centre of manufacturing was Stoke on Trent many art tile makers established studios in Lambeth and Fulham, close to their customers in the most affluent consumer market in the world, London. Often eschewing modern manufacturing techniques they experimented with design and decoration often seeking to recreate antique wares from around the world. We should also not forget the tile manufacturers to the west, those in Jackfield and Hereford and even those in the Black Country. Whilst being mass producers in the greatest sense of the word they also maintained a high quality both in manufacturing and design often better than those of the Stoke on Trent companies, even (or perhaps especially) the famous names. Many technical innovations are in the body of the tiles and are unseen, we can however readily appreciate when the techniques impact on visual experience. Much of the impetus was to imitate colours seen on eastern and oriental pottery and to produce new colours, bright colours, especially the translucent blues, reds and pinks. glazes which were inaccessible to European potters of the mid 19th century. Sky blue (celeste), pinks and reds remained more expensive colours in to the twentieth century and even to some extent nowadays.